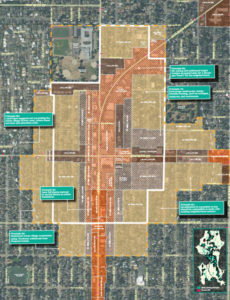 Download the draft zoning map, allowed housing information and more here. The Crown Hill Urban Village Neighbor-to-Neighbor meeting place and time have changed due to an emergency closure of our previous location. We will now meet at the Greenlake library from 11:15am – 1:00pm this Saturday, November 5th. Please join your neighbors from Crown Hill Urban Village Committee for Smart Growth at the Greenlake Library on Saturday, November 5 from 11:15 am to 1:00 p.m. We’ll talk about the new borders, the zoning changes, what we know about the goals of the upzone. We’ll discuss the draft maps, gather your questions, answer what we can, and share them with the City. We’re hosting this meeting in anticipation of a November 15 Design Workshop the City Council is conducting on CHUV’s draft zoning maps. (RSVP for the design workshop here – space is limited.) Our goal is to incorporate as much community feedback into the City’s process for map approval as possible. With a limited number of people able to attend both, we anticipate getting more voices to the table by offering a community-only opportunity to learn about the new draft maps.